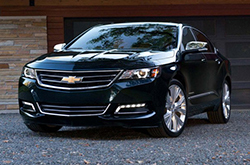 Noted as one of KBB.com's Best Family Cars of 2015, the Chevy Impala is a highly desirable, reliable vehicle. It offers superb fuel efficiency, comes with innovative technologies and is available with a collection of first-rated advanced safety features. On top of these excellent features, the 2016 Chevy Impala adds new exterior paint colors, fresh technology functions and a brand-new model: Impala Midnight Edition, into the mix. Each of these new inclusions take the Impala's appeal up a notch for 2016 and draw in more buyers across the market. Continue reading our 2016 Chevy Impala review below to learn even more about all the new features on this latest version of the family sedan. 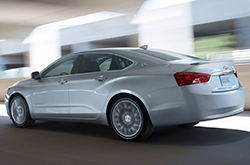 The 2016 Chevy Impala in Springfield is a full-size sedan available in three trims: LS, LT and LTZ. For the new model year, the car is also offering buyers the Impala Midnight Edition model, which is available solely on LT and LTZ trims. In line with its moniker, the car comes with a Jet Black paint job, black grille, black Chevy bowties, 19-inch aluminum wheels with black accents, a black rear spoiler and a black interior. Additional small modifications have also been made to the sedan, giving it a unique appearance. Aside from this standout arrival this year, the Impala now offers Apple CarPlay capability and wireless charging. It also adds five new exterior paint colors to its palette: Heather Gray Metallic, Siren Red Tintcoat, Citron Green Metallic, Green Envy Metallic and Mosaic Black Metallic. Want first-class power? The 2016 Chevy Impala in Springfield has that, too. It's available with a 2.5L iVLC and 3.5L V-6 engine. The former delivers 196 horsepower and 186 lb.-ft. of torque while that latter generates 305 horsepower and 264 lb.-ft. of torque. Each displacement comes matched with a six-speed automatic transmission, which helps the vehicle deliver optimal performance. Want to keep learning about the latest Chevy Impala? Scroll down and keep reading our 2016 Chevy Impala review. If you've ever thought about purchasing vehicles like the 2016 Toyota Avalon, Buick Regal, Chrysler 200 and the Ford Taurus in Springfield, compare Chevrolet's new 2016 Impala first; we're certain that it's perfectly designed for you. The Impala's user-friendly cabin amenities and inexpensive price are just a few of the notable qualities that shoppers will appreciate. You'll certainly see it's a fabulous value when you compare its price to competing vehicles. Check out our Quick List under this paragraph for more info! 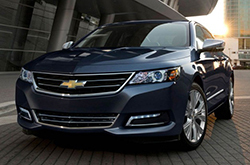 Thanks for choosing Reliable Chevrolet as your resource for 2016 Chevrolet Impala reviews and comparisons. Our reviews are recorded by well-informed automotive writers - it's just another resource we provide as a top-rated Springfield area Chevrolet dealer. Make wise decisions when it comes to your next auto purchase - don't take guesses! Each summary is jammed with facts and vehicle features in a clear layout that's easy to understand. Discover more about our great portfolio of vehicles; visit the research index to review and compare other models offered by Reliable Chevrolet now!